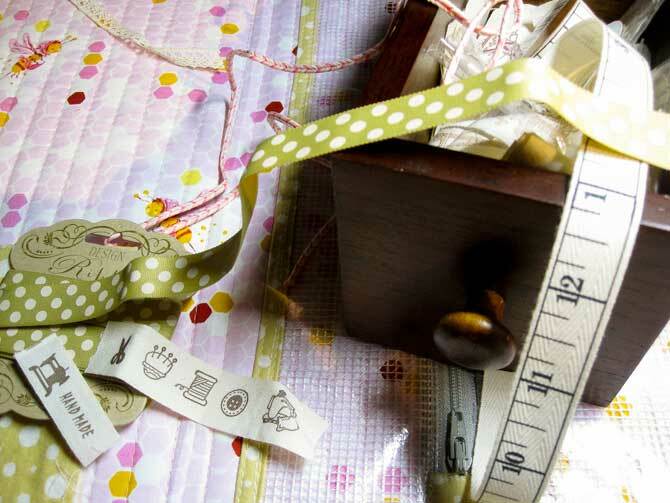 We’ve raided our stash of pretty and fun ribbons and buttons to make this portfolio. This week on QUILTsocial, we’ve been creating a sewing portfolio that’s ready for fun and creativity when ever you are and portable for where ever you go. We’re nearly finished our Pret-a-porter portfolio, so let’s wrap it up, we’ve got places to go! Here are 5 important sewing notions to finish the sewing case: Fray Check, Flatter, 505 spray, a tailor’s awl, and Clever Clips. 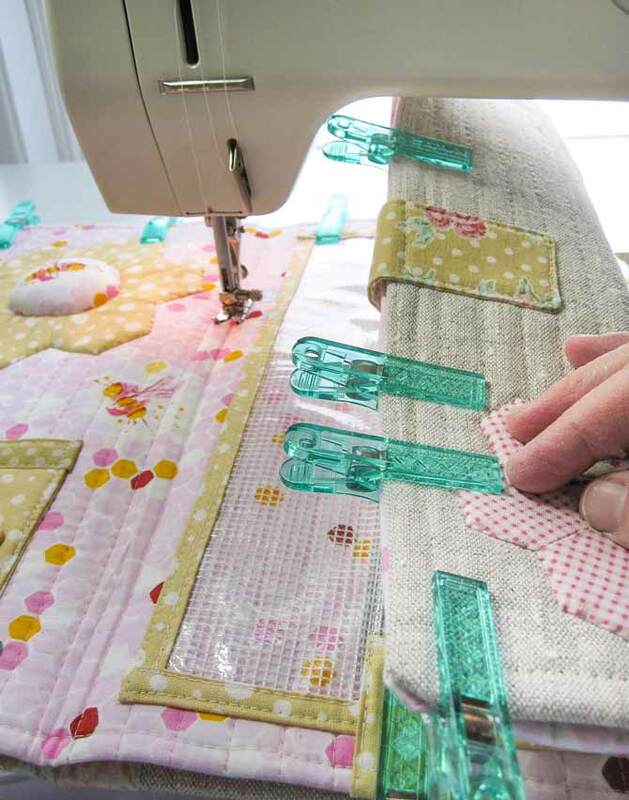 Make a quilt sandwich of fabric and backing, large enough for the scissor holder, and trace the scissor holder template, adding ¼ʺ seam allowance. In order to make sure your scissors don’t poke a whole through the holster, interface the bottom portion, as indicated on the template. Embellish the front of the scissor holder using buttons, lace, twill tape, etc. With right sides together, and batting on the back, sew the scissor holder together, leaving an opening for turning on one of the sides, as indicated on the template. Clip corners and curves. Turn right side out. Press. 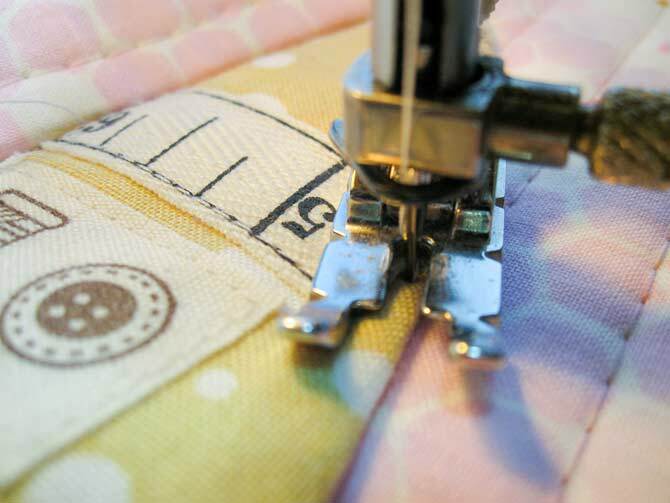 Sew the scissor holder to the lining, using a ⅛ʺ seam allowance. I did two passes of this stitching to make sure it’s really secure. Go slowly as you’re sewing through several layers. Put a pair of scissors in the holder to mark the position of a cord that will secure the scissors while you’re on the road. Use a tailor’s awl to make holes through the batting, fabric, and extra firm interfacing. Cut a 10″ section of cord, and apply Fray Check to the cut ends. Allow to dry. 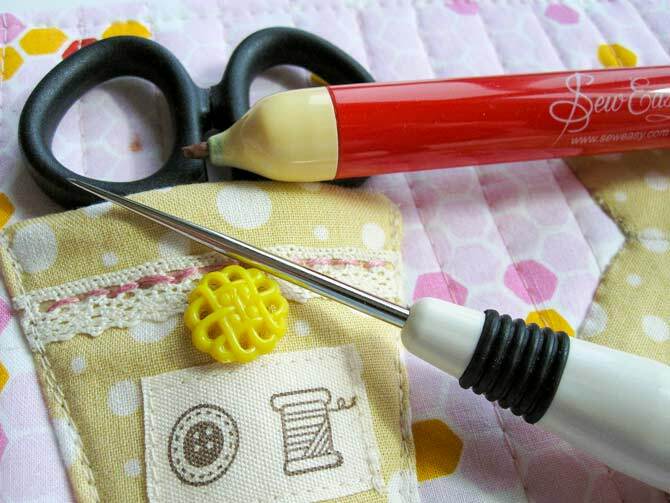 Thread a large eye sharp needle with the cord and bring it through the loops of the scissors (see photo). Place a dot of white glue on the wrong side of the lining to keep the cord in place. 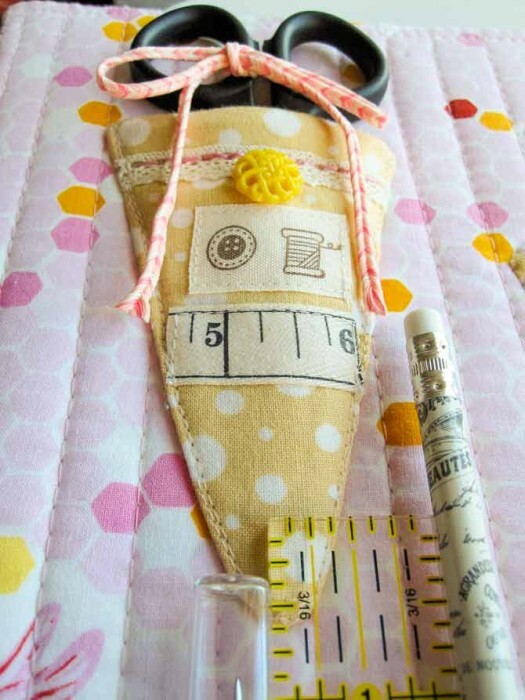 Sew the scissor holder using a ⅛ʺ seam allowance. Pass twice for extra hold. Mark the position of the cord in the scissor holder, and use a tailor’s awl to create holes for the cord. A large eye needle helps install the cord into the scissor holder. Those scissors aren’t going anywhere until you untie them! Now we have two lovely halves of what’s about to become a great big portable sewing deal. Before we put them together, take a minute to press both halves with a light spray of Flatter, to make sure everything is as flat and crease-free as possible. Take care not to damage the vinyl pouch. 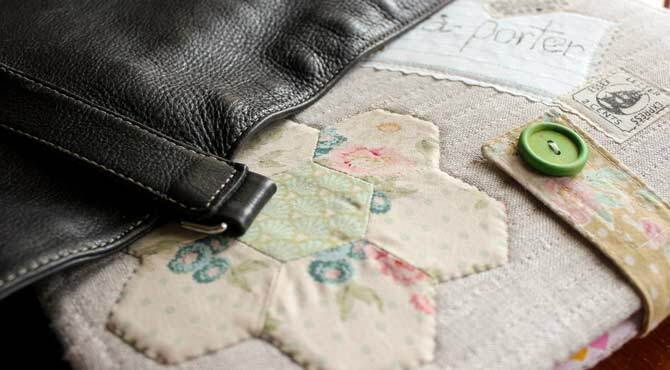 Place the outside of the portfolio right side down on an applique mat. Spray lightly with 505 adhesive. Carefully position the inside on top of the wrong side of the outside (the wrong sides are now together). Check to make sure the edges are as even as possible. Use large Clever Clips to keep both halves aligned. Gently fold one end of the portfolio so that it can fit through the machine. This is amazing stuff! Use it to make sure all the steps in making this portfolio are as smooth and pressed as possible. 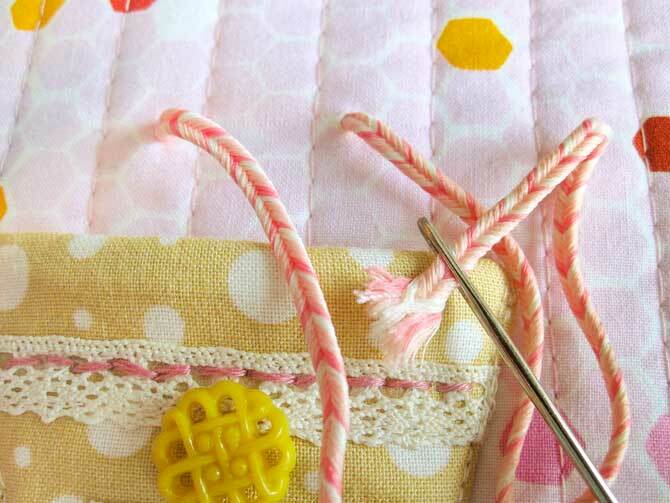 Use small slip stitches to sew the edges together by hand, keeping the edges aligned as much as possible. This will take a while to do, but it will make for a neat and sturdy finish. Once you’ve finished, give the finished portfolio a good press with steam, taking care not to damage the vinyl pouch. Now, you’re ready to load up and go with a very pretty and practical portfolio. I hope you’ve enjoyed this project, and that your sewing adventures are not only fun, but also productive. Until we meet up again, remember, to make a mess and have fun! Le voila! 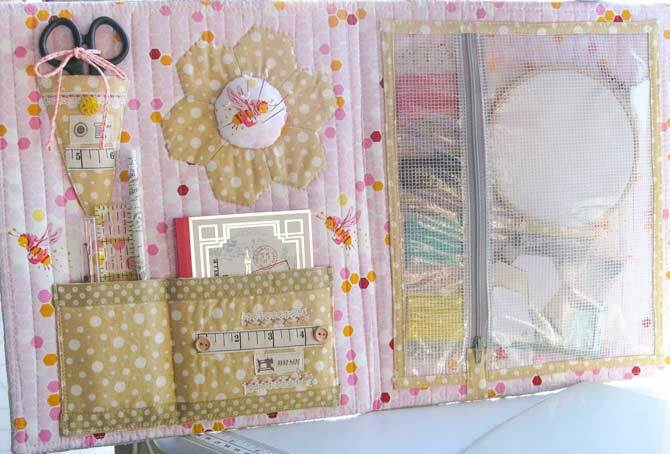 A portfolio that offers pretty storage for portable sewing projects. Portable sewing requires a few bits and pieces. This portfolio ticks a lot of boxes for creative types on the move. This case is closed, and you can take it with you when you’re sewing on the road. This is the front, tucked nicely into my brief case…. … and when you get to where you’re going, your stitching world comes with you. 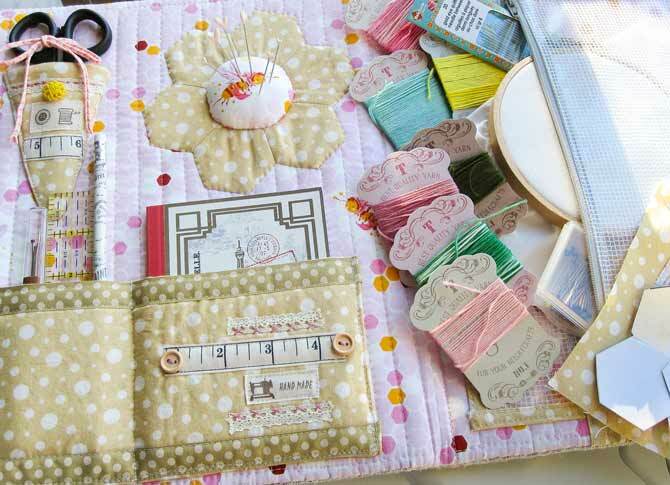 Pretty, practical and oh, sew portable! The finished portfolio, while useful, was quite challenging to photograph. I tried several different angles to showcase all the details. I hope you get a chance to make one for yourself. It really is quite a lot of fun to do, and very useful too. So pretty and practical. Am going to try some of the techniques! Thank you so much Shirley! I hope you enjoying making your own stitching portfolio. I love all the little bits of trim and special touches– makes me think of creative ways to use my collection of vintage trims that have been handed down to me! Lovely! Oh yes, Sarah! Use them on something you’ll see and enjoy all the time. They will become even more treasured when they are used for something useful.